I’m sure most of you Neo owners know about Pulstar and what a great shooter it is, so this is for people who don’t own a system and have never heard of this game. Enough said, it’s review time. In Pulstar you control a cool-looking spacecraft with the capability of being armed with various types of super weapons. In addition, there is the option of using the weapon power bar, which consists of two halves. The right-hand side of the bar turns blue when you depress the fire button, when fully charged your ship delivers a devastating emission of energy. Meanwhile the left-hand side turns red when it is continually pressed, shooting out a barrage of smaller, rapid blasts. The combination of super weapons and a power bar equals some serious onscreen action. The graphics are truly outstanding for this type of game. 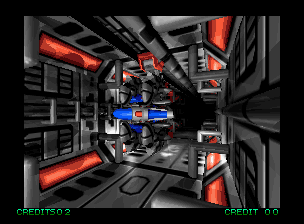 The enemy spacecraft and as well as your own seem three-dimensional when rendered on screen, not to mention the mini-cut scenes between levels. I find it amazing to watch the beautifully animated backgrounds scroll by while blasting everything in sight. 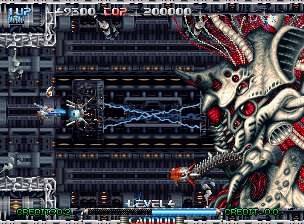 The bosses, too, look great despite their large size, usually taking up about half the screen if not more. The music in this game is outstanding. I have found myself playing a few rounds of the game in order to die and wind up at the music test screen: just to hear some tunes in their crystal clear digital format. (The Level 1 track is my personal favorite) Really though, this music is good by itself; in actual game play the combined experience of the tunes and sound effects will make you feel like you’re in an arcade. 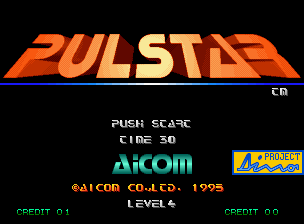 In my opinion, Pulstar’s game play is very solid. I have heard some people gripe about the game being too challenging, especially in the later levels. Personally, I would rather have a game be way hard than too easy. I don’t want to be able to demolish the game when I first sit down with it. There is a hefty reliance on strategy and not just blasting everything in sight. Using the charged weapon is key, and requires careful precision. Also, once you obtain a power up, a small orb appears at the posterior end of your ship. This can be used to your advantage by deflecting/absorbing oncoming enemy fire and taking out small enemies that run into it. 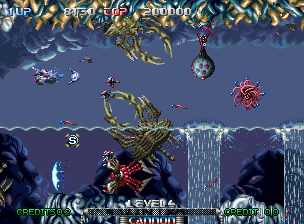 The game play is also helped by the speed of the background and maneuverability of the ship. The balance of the two creates a nice rhythm. If you enjoy shooters, you’ll play this game again and again. While the enemy attack patterns stay the same, it’s always fun to try and blast everything on the screen. Overall, Pulstar is a must-have for any Neo owner and a solid piece in anyone’s collection.